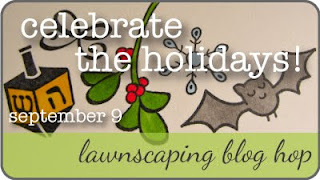 Welcome to the first ever Lawnscaping Blog Hop! So glad you’re here! You should have come to me by way of the very talented Ivy. This month's theme is Holiday projects!! The hop runs from Friday, September 9th - Sunday, September 11th! Make sure to comment on all of the blogs because there are LOTS of prizes to be won! All the details can be found on the Lawnscaping home page. Next head on to the extremely talented Ashley Newell's blog. If you've gotten off track, don't worry! Head on back to Lawnscaping to see the complete list of designers and prize information! I made a card using the new Happy Haunting stamp set from Lawn Fawn. I paper pieced the house and made the ghosts from Clearly for Art modeling paper by Wendi Vecchi. You just stamp the paper with permanent ink, cut it out and heat with heat tool. When it becomes soft you have about 10 seconds to mold it before it hardens in place. I added some close ups of the ghosts so you can see the effect - it's kind of hard to see on the straight on card picture. 1. Create card from black card stock - finished size is 5x5. 2. Cut smaller square panel and adhere to card. 3. Cut a circle in purple and green paper. 4. Draw a curved line on the green circle and cut out. 5. Adhere the bottom part of the green circle to the purple circle and adhere to card. Beautiful card! Love your use of patterned paper! What a perfect halloween card! The papers are amazing and I love how you have coloured and combined those fab LF images! wow! your card is a masterpiece! What a great card! Love the multi colored house!!! Paired with all the gorgeous patterned papers and vellum sentiment? This is just perfect! I love it. Oh wow! So colorful!!!! I love it! Just wonderful use of color!!! You did an amazing job on this! So fun! Love the mix of patterned papers and the dimension is awesome! So adorable.. I love the colors.. and that you used velum for the sentiment..
Wow! Great card! That green skull paper is to cute! Wow! Talk about attention to detail! What a great Halloween card! Great colors! Halloween is so much fun. Wow! This card is like Halloween and Mardi Gras all in one! Tons of fun! I love this set and you did a super job showing it off. Great card! What a spooky and fun Halloween card! Those are some awesomely creative ghosts, I love how they look like they are moving! This is really cute, I love the bright colors! The colors are awesome! Such a cute card! Fun card. Love all those bright Halloween colors! A VERY fun scene--so bold and colorful. I love this! So colorful and fun halloween card...cute card!! Way cool ghosts...and great instructions too! so colorful and cute! thanks for sharing! thats a lot of cutting! well done! love your colorful halloween card! I really like it! Just great!!! I love your mix of stamps and papers! Wonderful card. I love all those pattern papers - they add such a new dimension. Thanks for all the step by step instructions. Well done. Fantastic paper - and I love how you popped up the ghosts. Cute card! love the dimensions on the card it gives it such a 3d feel ,beautiful pp too. I love the colors you used on the house! Love, love, love the grass! Such a cool card!!! CUTE Halloween card, Donna! Love the details and layering!Beautiful paper-piecing! Fantastic use of color! I love the boldness of it all. How fun and pretty too! I love what you did with the DP! Fun card, I just LOVE your grass paper too! FAB! Fabulous colors and love the ghosts. Love your fun happy colorful halloween card Donna! Love the striped paper and all the color in the not-so-spooky house! Love the choice of colours :) what a fab card! Like that your house is so colorful- very cute! How colorfull. It looks great! nice card. i like all the dimension. I love how you made the roof mimic the background paper. Thanks for sharing this wonderfully spooky card. It is a perfect Halloween greeting. Great card...love all the color! So cute, love the papers you used! I love all the pattern papers you have used. Looks great!